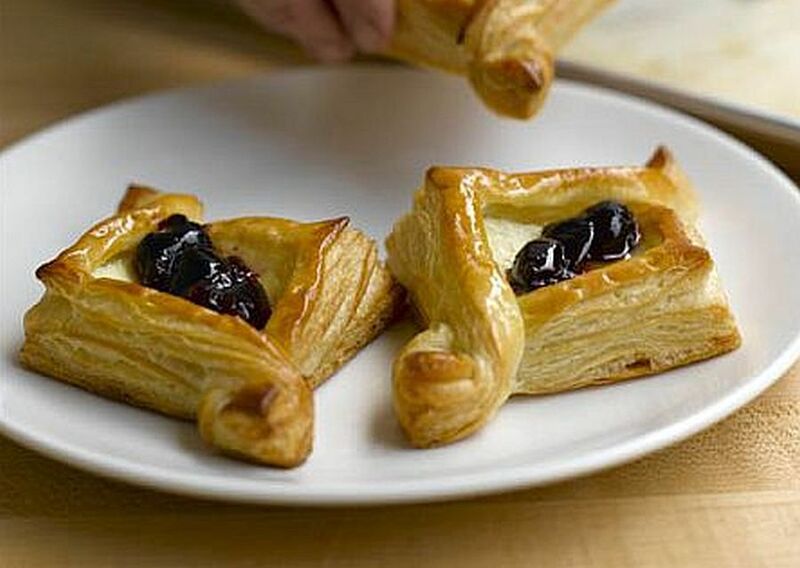 In German, blitz means variously "bolt," "lightning," "flash" and more, all conveying the concept of "fast," which is exactly what blitz puff pastry is -- a fast version of puff pastry that exists in almost all cuisines. It is common to find Viennoiserie, a French word meaning "things from Vienna," at breakfast or tea time in upscale hotels in Eastern Europe. Viennoiserie are baked goods made from yeast dough or puff pastry or blitz puff pastry. These types of dough are known as laminated doughs, ones that consist of many thin layers of dough separated by butter and produced by repeated folding and rolling. This recipe can be doubled or tripled and larger batches can be made with the dough hook of a stand mixer. Keep the dough well-chilled when working with it, and use as little flour as possible when rolling. The dough freezes well. This recipe is from Culinary Institute of America: Breakfasts & Brunches, by Lebhar-Friedman Books, reprinted with permission. Cut the butter into 1/2-inch cubes. Refrigerate until the cubes are chilled and firm. In a large bowl, combine flour and salt. Add butter, and toss with your fingertips until butter is coated with flour. Add all but about 2 tablespoons of cold water. Mix with a pastry blender or a table fork until an evenly moist but still rough dough forms. Add additional water, if necessary, as you mix the dough if it is not moist enough to hold together when pressed into a ball. Cover dough tightly with plastic wrap. Refrigerate until butter in dough is firm but not brittle, about 20 minutes. Turn dough out onto a lightly floured work surface or marble. Roll it into a 12 x 30-inch rectangle approximately 1/2 inch thick. Fold dough in thirds like a letter (this is the first of four 3-folds). Turn dough 90 degrees. Roll dough out again to a rectangle as described above, and fold once more (this is the second of four 3-folds). Wrap the dough tightly in plastic wrap, and refrigerate for 30 minutes. Remove dough from refrigerator and, working quickly, continue rolling and folding dough for the third and fourth 3-folds as described above, chilling the dough in between each of these folds for 30 minutes at a time. After completing the final 3-fold, wrap the dough in plastic wrap, and allow it to firm under refrigeration for at least 1 hour before using. The dough will last up to 1 week in the refrigerator or may be frozen for up to 2 months.